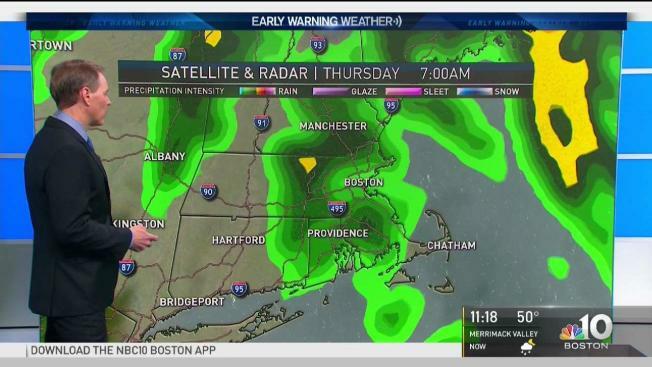 Wednesday night: Downpours to showers. Near 50. Tursday: A shower very early, then developing sun. Mid 60s. Friday: Partly sunny. Afternoon showers sweep in. Low 60s. Rain not only continues today, but becomes more intense as the day wears on, with downpours and embedded thunderstorms at times during the middle and late afternoon into early evening. Of course, this rain will slow travel on New England roads, especially for the evening commute. Although the intensity will diminish heading into the late evening and overnight, pockets of rain will continue from time to time throughout the night, accompanied by areas of fog, with both persisting into Thursday morning. With just over an inch of rain for most of us, this soaking rain will surely drive both the pollen count and brush fire danger down for a time, though combined with mountain snowmelt, we also should see some minor river flooding on northern rivers like the Saco, Swift, Mattawamkeag and Aroostook over the next couple of days. By mid to late morning Thursday, sunshine will be out for most of central and southern New England, and though a shower may redevelop, temperatures will respond to the breaks of sun by reaching the 60s, with more stubborn showers and cooler air in the North Country. Dry weather sticks around through Friday midday with a break between disturbances, but another energetic system will move into New England from the south Friday afternoon and night, prompting renewed showers and infusing the upper atmosphere with enough energy to prompt a few more scattered showers Saturday, even with some sun and a decent day, overall. Cool enough air arrives by Sunday to hold highs in the 50s for most and even bring a few snow showers to the northern mountains. Our exclusive Early Warning Weather 10-day forecast shows a summer preview arriving for the middle and end of next week.